"There aren't any assists there," says Rebellion's head of creative Tim Jones when I ask about why the Sniper Elite series has been so successful over the last 13 years. "It's you and the gun." Rebellion is based in Oxford, UK, and the developer/publisher works out of a giant warehouse-like building just a short walk down the river from the station. In the far right-hand corner from the entrance is the company's publishing arm, where the comics anthology 2000 AD is created and decades of old comics from various publishers are kept in an impressive archive. The rest of the busy floor is filled with development and marketing teams. Two other studios in Liverpool and Warwick support them, and the entire company totals at around 300 people. Rebellion's most recent game was Strange Brigade, and in the last few years Sniper Elite's popularity has skyrocketed. "Sniper Elite has been extraordinarily successful for us. Sniper Elite 4 was well over twice as successful as Sniper Elite 3," co-founder and CEO Jason Kingsley says. During an August Steam sale, the game didn't drop out of the top five sellers for the entire weekend, up there with PUBG. "As an independent UK games dev, I think that's pretty much punching above our weight." Sniper Elite smartly focuses on one thing and delivers it really well. Over the years, each entry has earned more than the last from our reviewers: 65% for Sniper Elite V2, 70% for Sniper Elite 3, and 84% for last year's Sniper Elite 4. In his review of the fourth entry, Tyler praised its much larger maps, celebrating the game's more freeform style of play. Each Sniper Elite game is more successful than the last. "Sniper Elite 4 is a bit more open world—not completely open world, because one of the challenges for the completely open world game is how to direct the player's experience," Kingsley says. "We've all played those quests where we've wandered off to do sidequests and forgotten what the bloody hell we're supposed to be doing." "What we haven't done is try to mess around with the core formula. We've iterated, we've improved it, we've added to it, and we've also listened to players as well. We read forums, we read comments, and we try to extract the good and interesting stuff from them." The series' audience is more on the ageing side than you'd typically find with other shooters. "We've got a little bit of an older and sophisticated player base with Sniper Elite. We don't have too many of the fast twitch players and younger audience, because it's a slower paced game, and that works for an older audience." "I think it's helped that it's had a laser-like focus on what it is and what it's about, and right from the outset that was about delivering the most authentic sniping WWII experience that we possibly could," Jones says. "And for the first game [in 2005], the world of third-person shooters was nothing like as established as it is now. All the things you take for granted about how you control things, how the AI performs, how you have level design laid out. There are lots of expectations that players and designers have about how things should be, but back then, it was much more of an open book." "We were able to focus down on it being the player's experience and how they dealt with any given scenario. It's you, your sniper rifle and anything else you can pick up along the way, and sophisticated AI. You had this sense of it being you versus the world, rather than you versus a bunch of pop-up things behind cover you then plough through with whatever weapons you picked up." The way Rebellion simulates ballistics, for example, underlines the series' authenticity. "It's still pretty unusual among shooting games, to have things like bullet drop in there on the higher difficulty levels, having wind affect which way your bullet's going like it's a golf game. These become very real things over long distances, and really add to the very physical, mechanical feel to the shooting gameplay that you have in World War II." 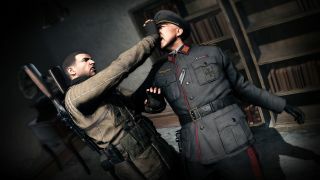 While big first-person shooter games have come around to choosing World War II as a setting, staying in that timeframe has allowed Sniper Elite to stand out. Moving the series to a more contemporary setting would require an overhaul, of sorts. "We get asked, 'are you going to bring Sniper Elite to modern day?' That's not necessarily something we wouldn't consider, but at the same time, a big part of what makes Sniper Elite feel like Sniper Elite and distinct from other titles is not just our attention to detail on ballistics and things like that, but also the nature of the weaponry. The technology of the time is very distinct, and as soon as you shift away from that, you're going to have a very different set of mechanics that become relevant. I think we hit upon a particularly well-defined, graspable niche that resonates with a lot of people into the history of it." Strange Brigade, Rebellion's last game, was released in August. Rebellion has a lot of other projects in progress, some of which it's not directly involved in making. While the company itself isn't currently adapting any 2000 AD properties into games, a few developers are working on licensed projects that scale from small teams to larger studios. "We've seen a handful of them, and they're really good," Kingsley says, discussing the games based on 2000 AD. "Very, very early days, and again, things could fall away. Finding the fun in a game takes time. But we will be announcing more about that later. What's exciting is good stuff is happening, and I'm really pleased with it. I trust the team I've got around me to make great games, but working with third parties and saying, 'go play with some of our toys', it's always a bit nerve-wracking because you wonder whether they'll get it. But they do. There's a lot of talented people in the games industry." "They sell the shares, people who own the shares get scared, people who run those companies don't get bonuses. The whole thing is driven by a need to continue to expand. And people can only afford to pay a certain amount for a certain number of games in a year. Most people have got a limited budget for things like computer games. "Games, for some studios, are getting more and more expensive," Kingsley says. "I hear some of the games in development are costing upwards of $150 million to make, and on top of that they're spending $50-100 million on marketing it. So you're talking about $250 million investment. How many copies of a game at £40 do you need to sell? Because of that £40 you've got tax, you've got distribution costs and all sorts of stuff. If you're lucky you might make £20. If you divide those two numbers, that's an awful lot of games to sell before you've even got your investment back. "I think for a lot of people that business model is not returning sufficient money, so they've got to work out a way of getting not just $50 off someone but $100, and ideally $1000 off some people. And that starts to shade into the area of free-to-play games." Kingsley says that Rebellion just charges for original singleplayer content, while giving multiplayer DLC away for free. "We're in a different place. We're privately owned, so it's me and my brother Chris. So, quite frankly, all that matters is we have enough money to make the next game, which is exciting, and make sure we pay the staff and keep the lights on. And so far everything along those lines is going really, really well. We aren't driven by the same need to continually get more money in, and to scale up." I ask how many projects Rebellion is currently working on. "Typically we work on one big game and two or three games at various different phases. So typically we're working on roughly three games internally. Actually, five games internally, but some at a prototype stage." There have been mentions in past interviews of a 'dream project' of Kingsley's, which I was intrigued to hear more about. He doesn't give much away. "That is in the early prototyping stages, yes," Kingsley says. "It kind of covers an area of genre that I'm very keen on. I won't tell you what it is yet. But it's an area of genre publishing that I'm keen on expanding—it's little explored in the game space. People recognise it and go, 'oh, that's a good idea'. The moment I start saying it, other people will start doing them." "And it's quite ambitious—it isn't going to be a small game. Well, hopefully it won't be a small game. It's far, far too early to talk about details, but it's an ambitious project, something that's been bugging me to do something about for probably over a decade now. And we're now in a position to be able to do something about it. It should be very commercial, but it should be very atmospheric and interesting. I'll leave it there." Kingsley cautions this dream project might not make it out of the prototyping stage, but it suggests an intriguing future for Rebellion beyond Sniper Elite. The studio is also at work on a sequel on to the game Evil Genius, and Strange Brigade represents a move into four-player co-op, a game type which has gained more traction in recent years with the likes of Deep Rock Galactic and Vermintide 2. I like the idea that Sniper Elite's focus has allowed the series to stand out as Steam has become flooded with games, and it sounds like it's opening up more and more opportunities for one of the UK's biggest and longest-running studios.